Back in the pre-punk mid-70s, I was a huge country-rock fan, and Poco was my favorite good-time band. I still went to see them play at every opportunity I could even though their leader, founder, and my draw to the band, Richie Furay, had recently left the band. 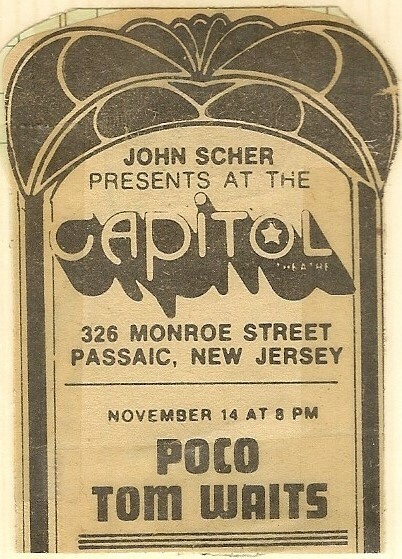 This night’s show was at the Capitol Theatre in Passaic, one of the New York area’s premier music venues. The Capitol was an old, un-refurbished movie theater that I frequented often. At the time, Poco’s line-up consisted of original members Rusty Young (pedal steel) and George Grantham (drums) joined by two second generation members on vocals: Paul Cotton (guitar) and future Eagle Timmy Schmidt (bass). In an odd twist, Poco would later achieve its greatest success when Young became a lead vocalist on songs that took them to a more soft-rock vein. The night’s historic moment came from the opening act, a then somewhat unknown Tom Waits. Few in the crowd knew of this disheveled, gruff and gravelly singer-songwriter who was best known at the time for having his “Ol’ 55” covered by The Eagles. Appearing solo with a piano, Waits could not even get past three songs before he was drowned out by the boos of the impatient country-rock crowd. The sight of seeing Waits responding to the rude audience with an obscene gesture before leaving the stage is forever engrained in my memory. I was at this concert…20 yrs old. I remember saying to my friend, “that man is a poet”. I didn’t know who he was, but wished he had played more. You are right, the audience was very rude.